The T-Tone Code Practice Oscillator uses a "twin-T" oscillator circuit to provide a shaped sine-wave tone, which is much more pleasant to listen to than the 555 timer-based square wave oscillator typically found in CPOs. It is also much better for FM transmission, and will support high-speed keying with a paddle and electronic keyer. A "line out" signal at up to 600mVPP is available, and a zobel network on the output of the amplifier provides for clean audio at higher volumes. Click here for a demonstration of the T-Tone's audio output when keyed by hand at around 15wpm and by a electronic keyer at 28wpm. 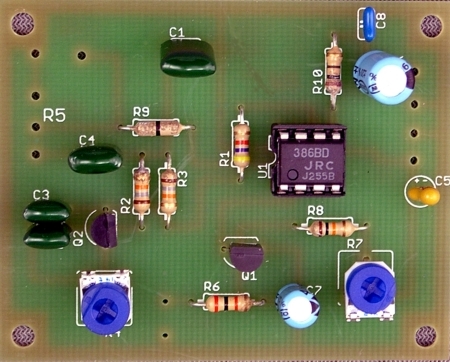 The classic Twin-T oscillator circuit is the same circuit used for the side-tone in OHR transceivers. 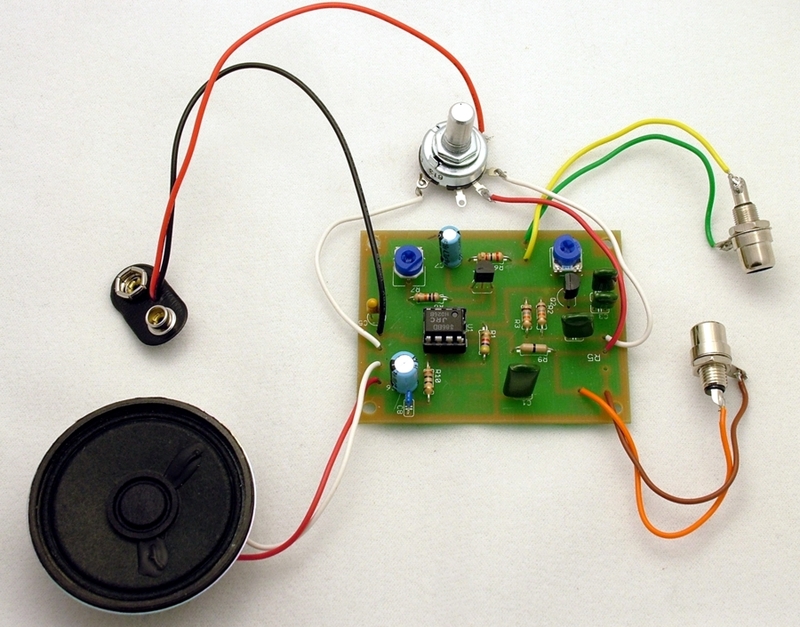 and the Katsumi code practice oscillator It feeds an LM-386 audio amplifier to provide plenty of audio power to drive a small speaker (included). The kit includes a high-quality printed circuit board (2'' x 2.5"), all necessary parts and controls, and detailed, illustrated instructions. The off-board parts, which are shown in the photo below, ARE included in the kit-- a 9V battery connector, RCA jacks for key input and line out, an audio taper pot for volume control, power switch, 8 Ohm speaker, and hookup wire. The frequency of the tone is variable via an onboard trim-pot. The oscillator runs continuously, but its output is turned on and off by the 2N7000 MOSFET keying transistor. This is the key to high speed operation because most oscillators are turned on when keyed, with a noticeable start-up time that makes them useful only at slow, hand-key speeds. A trim-pot works with the 2N7000 to shape the wave train, providing for crisp, clean dots and dashes even with electronic keyers at high speeds. Here is a photo of the assembled T-Tone, wired, with the included hardware.